An Air Force Research Laboratory experimental satellite and two other spacecraft are launched from Cape Canaveral Air Force Station, Fla.
WASHINGTON — The space-focused branch of the Air Force Research Laboratory is seeking proposals from the private sector "to advance the technology and scientific knowledge supporting all aspects of space systems," said a solicitation posted Feb. 23. The request from the AFRL Space Vehicles Directorate comes as U.S. Air Force senior leaders continue to push for faster technological change and innovation in the space business. They warn that rival nations threaten to erode the United States' ability and freedom to operate in outer space and have asked military laboratories to gin up fresh ideas. The solicitation explained that the United States military operations depend heavily on space systems to support combat forces around the world. 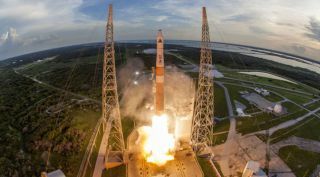 And it pointed out that innovative technologies are need to ensure U.S. space systems can operate under any circumstance, even under enemy attack. "Traditionally, space systems have operated unhindered in an uncontested environment. However, as space becomes increasingly competitive, congested and contested, new concepts, approaches, technologies and architectures are required," said the announcement. The AFRL Space Vehicles Directorate is located at Kirtland Air Force Base, New Mexico. It is one of the nation's premier sites for space research and development. "Our mission is to develop and transition innovative high-payoff space technologies supporting the war fighter, while leveraging commercial, civil and other government space capabilities," states the agency's website. The directorate is known for educational outreach programs for students, such as the Space Scholars and the University Nanosatellite Program. It has three branches: The battle space environment division focused on space weather sensing and modeling. The spacecraft technology division develops next-generation spacecraft buses and payloads. The integrated experiments and evaluation division brings together ground, space and near-space technologies into a virtual digital environment. Air Force Secretary Heather Wilson has been a proponent of greater outreach to the private sector for obvious reasons. "In a world where far more innovation is happening outside the government than inside it, connecting to the broader scientific enterprise is vital," Wilson told a science and technology conference recently. Wilson in September launched a review of the Air Force technology strategy. It directed the Air Force Research Laboratory to set priorities for future investments. China is the emerging space power that mostly worries Air Force leaders because of how quickly it is deploying new technology. "For the United States Air Force, our pacing threat is China because China is modernizing very rapidly," Wilson told reporters. Experts see China leading the way in groundbreaking space technologies like quantum communications satellites that are immune to cyber attacks. The AFRL has done some research in this area but the Pentagon has not funded a program of record.